How do the mobile climbing walls “EVEREST” work? The EVEREST climbing wall works like a vertical treadmill with climbing holds, and it is driven by an electric motor. The moving ‘treadmill’ produces the effect of a never-ending climbing route. What characterizes our climbing walls? We apply a new, patent-protected system that constantly and automatically changes the position of the climbing handles relative to each other … during climbing. The climbing route is thus not only never-ending, but also never repeating. The difficulty level of climbing can be adjusted by changing the inclination angle and the climbing speed automatically adjusts to the climber’s abilities. The climber is at all times close to the soft mattress, so there is no need to use any additional safety equipment. What wall models do we have to offer? 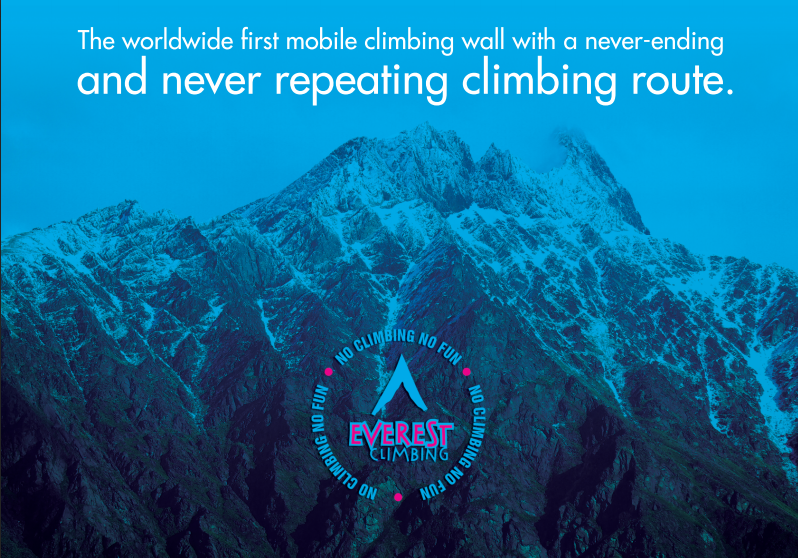 The “EVEREST” climbing wall is available in four versions: „PRO“, „EVENT“, „FITNESS“ and „KIDS“. other programs, that could be memorised and represent different difficulty levels of the exercise. The “Event” model was developed together with event agencies and operators of indoor playgrounds. For this group of users, the mobility and the affordable price of the climbing wall were important, in addition to safety aspects. Within just 30 minutes the climbing wall “Event” can be set up and started. a touchscreen that allows the operation of the wall in the “MANUAL” program. The “Fitness” model was developed in co-operation with gym operators. For this group of users, besides the security aspect, a compact size of the device was important. In order to develop a space saving model, we decided on a design which has to be mounted to the wall of the fitness room. At the end of May 2017, we presented our new product – the climbing wall KIDS – at the Festval4Family in Frankfurt, Germany. This model has been specially designed for children between 3 and 10 years of age. The main “operation area” for the new device are hotels, indoor playgrounds and games arcades. an optional configuration with a coin acceptor.